JB Zenhost - template designed by famous designers studio JoomlaBamboo. Template supports both the old version CMS Joomla! 2.5x or newer version 3.x. Template designed primarily for developers who want to create a website hosting company. Novelty studio became module Zen Featuretable, by which on the site can accommodate the list of services in user-friendly form. For the most rapid and high-quality search relevant services to create the template developers used T3 Template Framework. 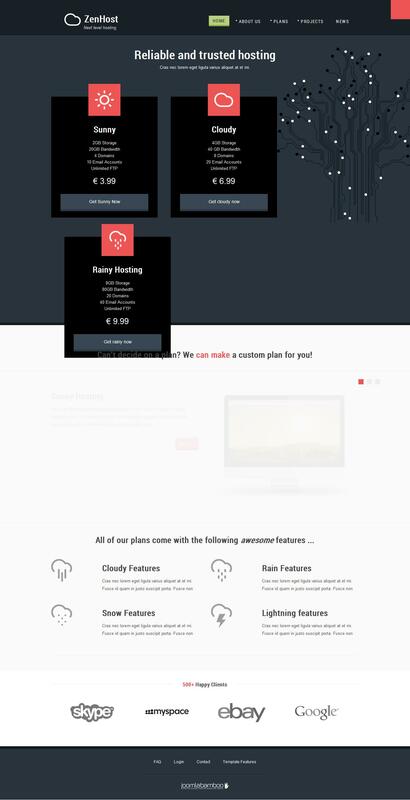 Template JB Zenhost easy to install and easy to use even for novice users. Sites, which are based pattern JB Zenhost, displayed correctly in all browsers and on all mobile devices.